We've known about Sony's Xperia Tablet Z for the last month or so. It promised incredible lightness, thinness, speed, and beauty. Guess what? It deliveres. 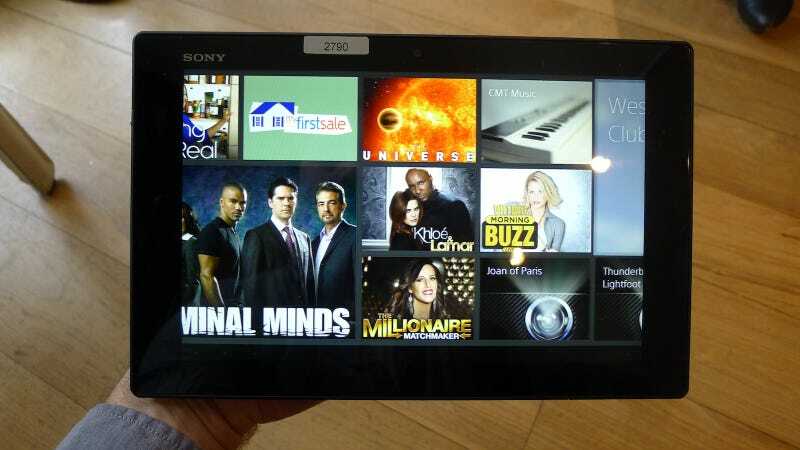 The Xperia Tablet Z is a 10.1-inch tablet that will launch with Android 4.2 (the most recent Jelly Bean update). It boasts a redesigned 1,920x1,200 screen, Qualcomm's beastly quad-core Snapdragon S4 Pro processor, 2GB RAM, NFC, an IR blaster, a microSD expansion slot, and it's listed as waterproof to one meter for up to half an hour. All that and it's just 6.9 millimeters (0.27 inches) thick and it weighs only 495 grams (1.09 pounds). To put that in perspective, that's the lightest 10-inch tablet in the world, and it's the thinnest tablet period (just eking by the iPad mini's 7.2mm frame). Not surprisingly, it's a joy to hold. It feels impossibly light; you wonder how there's room for a computer inside. It's also extremely well-balanced. And the waterproofing's not just hype; we turned on the screen and dunked it in a fishbowl, and the touchscreen worked just fine after we pulled it back out, even while wet. We've said it a million times before: all gadgets should be waterproof. The display uses Sony's new Mobile Bravia Engine 2, which the company claims gives it twenty percent better color reproduction than the latest iPad. While we couldn't do a side-by-side comparison, we can tell you that the screen is gorgeous. It was bright, sharp, and colors were incredibly vivid. Low reflectivity, too, an area where the iPad mini left a lot to be desired. Another positive sign: Sony is finally stepping back a bit and letting Android shine. The Xperia Tablet Z does have a third-party skin, but it's light and mostly only noticeable on the desktop. It has the same Battery Stamina Mode as the Xperia Z and ZL phones, which is a clever power management solution. Sony says it will boost standby time up to 400 percent, which would be impressive. The Tablet Z also comes with TVSideView, a very slick app that acts as both a TV guide and a means for controlling your home entertainment setup via the built-in IR blaster. Unfortunately, the software was still a couple months away from being final when we got to play with it. The overall experience was frequently laggy and slow, and there were some crashes. Hopefully that will be addressed before the Tablet Z goes on sale in May. There will be some good-looking accessories for it, including a very sturdy stand and some nice, thin covers. Sony is building NFC into a lot of its upcoming audio products. This means that you'll be able to tap it to the Xperia Tablet Z and it will instantly pair the audio. We tried it on a few speakers and headphones and it worked seamlessly. The Xperia Tablet Z will come in 16GB and 32GB flavors for $500 and $600, respectively. That ain't cheap! But if the software can live up to the promise of its high-end hardware, it might just be worth it. It will be available in Europe starting in March, but it won't hit the U.S. in until late May.